All our food is prepared and delivered by the Farm Kitchen. Parents can use the link below to login to their account. The Farm Kitchen are dedicated to providing freshly prepared, delicious school meals made using the highest quality ingredients. They believe passionately in the importance of children eating good quality food and being encouraged to develop an interest in the food they eat and where it comes from. 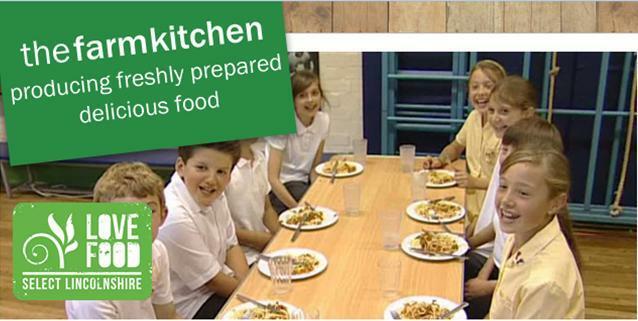 The Farm Kitchen prepare, cook and deliver delicious school lunches throughout Lincolnshire. Click on the link above and you will be able to find out lots more information on what they do and where your food comes from. If you believe that your child may be eligible for Free School Meals, you will need to make an application to the County Council. In addition to this, families who receive one of the following qualifying benefits may be eligible for free school meals and Pupil Premium, which means the school will receive an extra £1,300 per eligible pupil per year from Central Government to fund valuable support such as extra tuition and learning support. Therefore, even if your child is eligible for universal infant free school meals, please also apply for means tested free school meals if you believe that he/she may be eligible.